While adopting a furry new friend can be an impulsive decision, helping a rescued dog or cat adjust to life at your home demands planning, care and commitment. Here’s how to do it right. Whether an old pet has passed away or the kids are begging you for their first puppy, adopting an animal can be a very rewarding experience. Every day, homeless animals are being brought into shelters, but finding individuals willing to take in those pets can be a challenge. 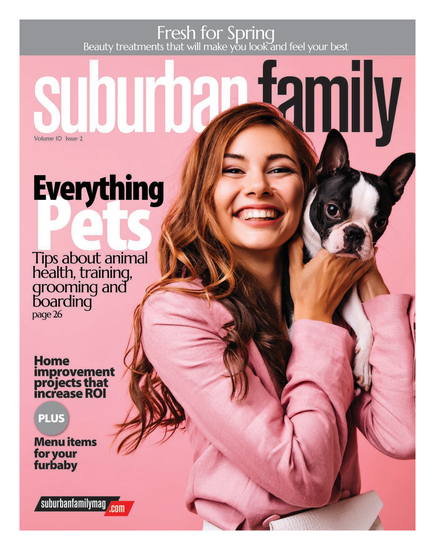 If you’re ready to step up, dog behavior specialist Christine Nolan—owner of Your Dog and You training and a volunteer at Voorhees Animal Hospital, helping dogs prepare for their new homes—offers advice on making the transition as seamless as possible. Getting prepared. Before picking up your pet, have a nametag ready with your contact information and address. Do your research on healthy food and treats; some dogs, depending on size and breed, require different food. Be sure to have an appropriately sized bed, a crate and a safe toy. Meeting the family. If you have kids or another pet at home, Nolan suggests doing a meet-and-greet at the shelter. This will allow your family to feel comfortable with your new pet, and vice versa. “Your dog needs to feel secure and safe,” Nolan notes. Your first day. When you arrive at your house, first take your dog on a walk, on a loose leash, Nolan suggests. When you’re ready to enter the house, be sure to enter first with your dog behind you on the leash. “Like you would a guest, give your new pet a tour of the house. Allow them to sniff around,” says Nolan. Then, lead your dog to the water and food bowls, and the bed. Finally, show them the door that they will be using to go to the bathroom. Maintaining structure. While your dog will start to feel comfortable after the first week, as a responsible pet owner, it is important to maintain structure on an ongoing basis. For the first two weeks, take your pet for a walk every day on a loose leash. “This is part of bonding and building a relationship,” says Nolan. Once you feel you have gained trust, consider playtime in the backyard. Visit the vet. Follow-up care is especially important in the early weeks. “Schedule an appointment with a veterinarian in the first seven to 14 days,” Nolan says. Plus, as you build a relationship with your pup, it’s good for a veterinarian to be familiar as well. These friendly animals are in need of caring homes. All Dogs Poop offers affordable residential dog waste removal in South Jersey. They donate 1 percent of monthly revenue to four local rescues, including the A.W.A. and animal orphanages. Voted Best Pet Cleaning Service—2010 Best of Philly HOT LIST. Improving the lives of New Jersey pets and their owners since 1983. As a family-owned business, we are a team of pet lovers who take serious pride in the professional installation and training of Invisible Fence Brand systems providing our clients with complete peace of mind knowing their pet is safe at home™. Coit Cleaning Services is a proud sponsor of the Animal Welfare Association. Their cleaning services range from pet stain and odor removal on carpets and upholstery to cleaning air ducts, dryer vents, tile and grout.